A place exists in Alaska where the past lives on, where the cries of "gold in the Yukon" still echo from steep canyon walls; the sounds of bar room pianos and boomtown crowds ring out in the night; where the romance and excitement of yesteryear linger around every street corner. That place is Skagway! 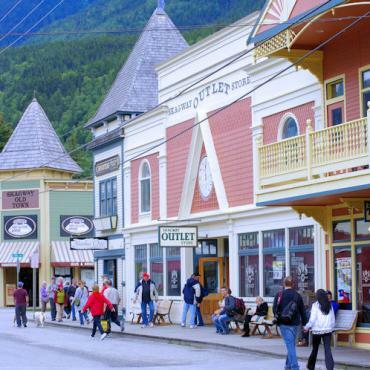 Much of Skagway is within the Klondike Gold Rush National Historical Park and many of the buildings and old shop fronts have been restored so the town looks similar to the boomtown it was in the late 1890s. Broadway Street, the main avenue in town, bustles with activity and people, some in gold rush attire. 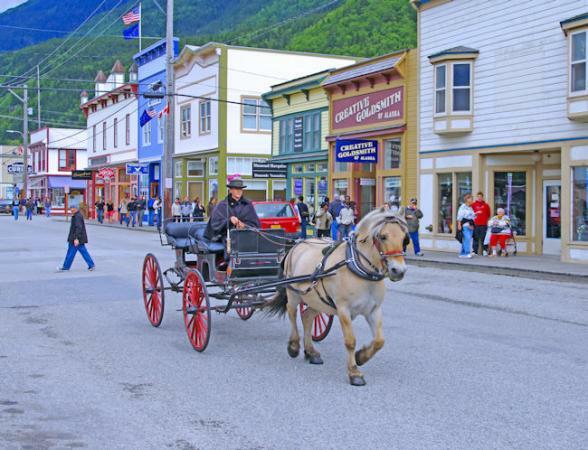 Skagway and the nearby ghost town of Dyea marked the start for over 40,000 gold rush stampeders who headed to the Yukon by way of the Chilkoot Trail or the White Pass Trail. 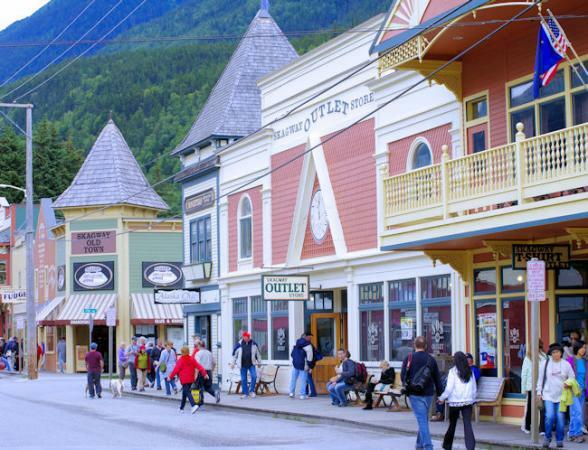 Skagway's population exploded to 20,000 with saloons, hotels and dance halls on every corner and became infamous for its lawlessness. For a time, Soapy Smith ran the town and his gang conned and swindled naïve newcomers out of their money and stampeders out of their gold dust. A mob of angry citizens finally banded together and Soapy Smith was killed in a gunfight. The gold rush was also the birth of the White Pass & Yukon Railroad. In 2 years time, with little more than picks, shovels and blasting powder, the narrow-gauge railroad reached Whitehorse in Yukon Territory. The construction was nothing short of a superhuman feat. The historic route now provides three-hour tours to the top of the mountain pass and back to Skagway. 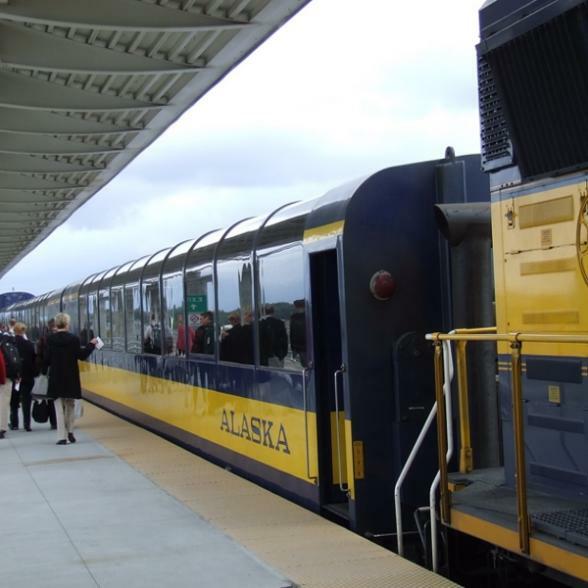 Seated in parlour cars, passengers ride up the most spectacular part of the trip viewing scenery such as Glacier Gorge, Dead Horse Gulch, and Bridal Veil Falls. At the top they see the White Pass at 2,885 feet which is also the international boundary between U.S. and Canada.